The term mood swings is used to describe the rapid change of moods. A person can go from happy and cheerful to angry or sad in a relatively short period of time. Mood swings are associated with many mental health problems like depression or bipolar disorder, but it is also a symptom associated with hormonal imbalances in both men and women. For example, men with low testosterone levels experience mood swings, just like women in PMS and menopause. When it comes to menopause, other symptoms associated with the change can aggravate mood swings and make them more frustrating. Dietary supplements pose as a natural and effective solution for mood swings, but it can be difficult to choose the right product. To help you out, this post will focus on menopause supplements for mood swings. Can menopause cause mood swings? Before we discuss the best supplements for menopause swings, it is important to address this common symptom first. Like many other symptoms associated with the change, mood swings are also caused by hormonal fluctuations. Declining estrogen levels coupled with impaired levels of serotonin, a mood-regulating neurotransmitter, affect the way a person feels and behaves. In addition, mood swings can also result from other symptoms of menopause such as hot flashes, night sweats, fatigue, and other physical changes. Experiencing these symptoms can automatically change a woman’s mood in a matter of seconds, especially if they are severe. Although every menopausal woman can experience mood swings, some ladies are at a higher risk than the others. Your risk of getting this symptom increases if you have a history of severe PMS and prior episodes of depression or some other mental health problem. Unsatisfactory relationships, difficult living situation, and stress are also common risk factors for mood swings. Eat healthy foods such as fruits, vegetables, lean protein, whole grains, Omega-3 fatty acids, folate etc. You can combine menopause supplements for mood swings together with these tips. Here are the best supplements to try for this purpose. 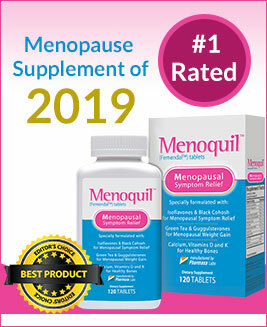 Menoquil is one of the best supplements for menopause mood swings and a number of other symptoms associated with the new chapter in every woman’s life. The product is highly recommended to perimenopausal, menopausal, and postmenopausal women who want to experience relief from symptoms that are affecting their quality of life. The supplement features a safe, proprietary selection of natural ingredients that improve hot flashes, night sweats, mood swings, and vaginal dryness. Ingredients found in capsules include vitamin D to alleviate mood swings and irritability, vitamin K for strong and healthy bones, calcium and phosphorus for strong bones and decreased risk of osteoporosis, and red clover for hormonal balance. Plus, the formula also contains green tea leaf to boost energy and metabolism, guggul gum resin for weight management, chaste berry for the relief of multiple menopause symptoms, dong quai for mood swings, vaginal dryness, and hot flashes. Other ingredients include black cohosh, soy isoflavones, black pepper, and cnidium monnieri fruit. Estroven is one of the most popular menopause supplements in the US with almost a million of users, according to the official website. The makers of Estroven didn’t create just one product, but more of them and each item addresses specific problems that women in menopause experience. 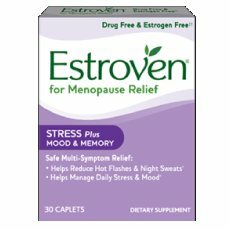 Estroven Stress Plus Mood & Memory is specifically created, as you can guess, to help menopausal ladies manage stress and improve mood and memory, all of which are impaired during this special time in your life. Besides these benefits, the product also alleviates hot flashes and night sweats. The driving force behind the efficacy of the product is an all-natural formula which focuses on naturally-sourced black cohosh and soy isoflavones to reduce the frequency and severity of vasomotor symptoms (night sweats and hot flashes). The formula also features magnolia bark whose purpose is to relieve stress, anxiety, and irritability, while ginkgo biloba enhances brain function including memory support and mental sharpness. 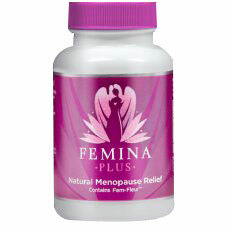 Femina Plus is marketed as the fastest-working herbal supplement which works in as little as seven days. The product contains a proprietary blend called Fem-Fleur consisting of three ingredients: angelica gigas nakai root, cynanchum wilfordii, and phlomis umbrosa. Ingredients in the formula work six times faster than black cohosh, according to the manufacturer. Femina Plus was created to address a number of different menopause-related symptoms such as mood swings, hot flashes, night sweats, insomnia, vaginal dryness, joint discomfort, fatigue, and nervousness. Unlike many other products on the market, this one doesn’t contain soy and soy derivatives, which is good news for ladies who are allergic to the ingredient. It is also important to mention that product doesn’t contain caffeine or some other stimulant and it doesn’t feature the synthetic version of the hormone estrogen. Profemin is a dietary supplement created specifically to utilize the synergistic benefits of three Asian herbs that have been used throughout the history for medicinal purposes. The product contains angelica gigas which is used for gynecological health support, phlomis umbrosa to exhibit anti-inflammatory and pain-relieving effects, and cyanchum wilfordii which improves blood flow. 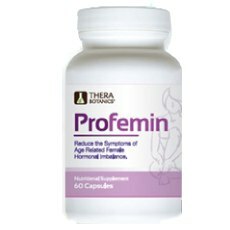 With regular intake, Profemin can help alleviate symptoms such as cold and night sweats, hot flashes, mood swings, aches and pains, vaginal dryness, trouble sleeping, nervousness, among others. The official website also offers a free-trial option. EstroVive is a natural product whose development was based on scientific research. The primary purpose of EstroVive is to help relieve and eliminate common symptoms of menopause, in an entirely natural way without potentially harmful ingredients. The regular use of the supplement helps users achieve positive mood, normal body heat regulation, healthy sleep, hormonal balance, increased joint mobility, improved concentration, energy boost, and higher libido. EstroVive contains a powerful formula whose primary ingredients include black cohosh for hormonal balance, better sleep, and relief of many symptoms, dong quai for hormonal balance, and red clover which is abundant in isoflavones that your body converts to phytoestrogen. Other ingredients include licorice for hormonal balance and vitex berry which alleviates a number of feminine issues. Mood swings are a common symptom associated with many health problems. Even though men can experience mood swings, women are more susceptible to the symptom, especially during menopause. Besides hormonal balance, other symptoms can also cause mood swings and it can be difficult for an affected woman to put up with these constant episodes. Luckily, it is possible to alleviate mood swings with a healthy lifestyle, but dietary supplements also play a role. This article focused on menopause supplements for mood swings that you could try. When buying dietary supplements, regardless of the cause, make sure the manufacturer is reliable and other users had positive experiences. Feel free to consult your doctor about these products, especially if you’re taking medications.